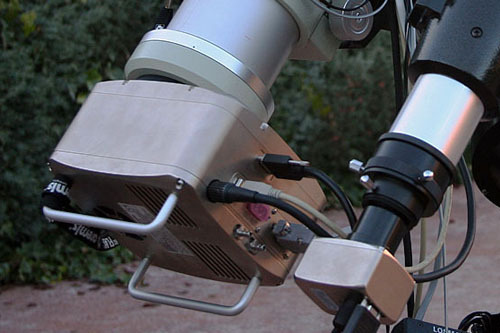 The FSQ is a four lens refractor astrograph that uses two fluorite elements. It is a modified Petzval design and, in my opinion, the best 4" refractor astrograph ever made to date. Most of time the FSQ is used in its native f/5 configuration, 530 mm focal length. With its dedicated focal extender the FSQ can be used at f/8 (850 mm f.l.) for some visual and imaging applications. The ASA N10 is a f/3.6 25 cm (905 mm f.l.) highly corrected Newtonian Astrograph produced by Astro Systeme Austria in Grünbach, Austria. This is a very fine piece of equipment: The glass used for the mirrors is Suprax 8488 produced by Schott in Germany with Hilux Enhanced Aluminium mirror coatings applied in the UK. The corrector is a three element ED glass Wynne designed by Philipp Keller and made in Russia. The tube is made of carbon fiber (CFK) and comes with a massive 3" focuser by JMI. The N10 can be also operated af f/6.7 with a 1.8x converter-corrector lens for a focal length of 1700 mm. The unit shown is 1/7.2 PV wavefront and 0.981 Strehl. 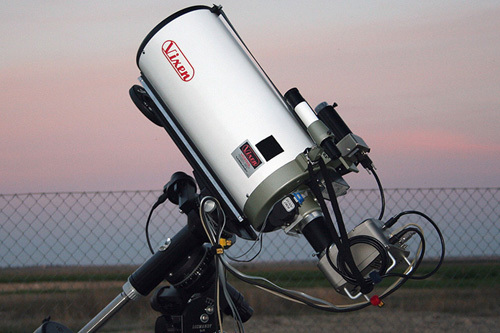 The VC200L by Vixen is a 8" (20 cm) aperture Cassegrain reflector with a built-in three element corrector lens its primary focal lenght is 1800 mm (f/9) and there is a reducer that allows to operate the scope at about f/6 (1200 mm f.l.). 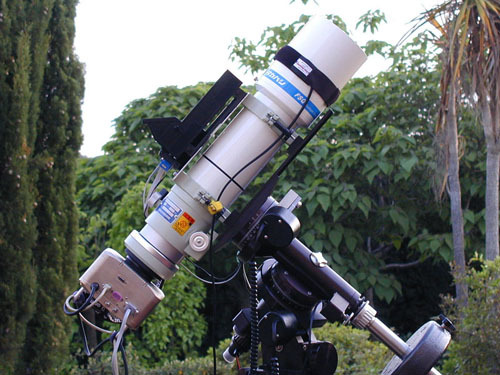 The optical quality of this scope cannot be compared with that of apochromat refractors or high quality reflectors, but it is very reasonably priced and allows you to cover a big sensor with almost 2 meters of focal length. Being very light it can be used with a medium duty mount like the Losmandy G-11. I choose these scopes because all of them are well corrected for the field covered with my primary camera, a SBIG STL 11000M. This was the first Kodak KAI 11000 CCD based camera available to amateur astrophotographers, years ahead of other manufacturers. The KAI 11000 sensor is a 12 mega pixel device and its size is the same as a 35 mm film (24x36 mm). This sensor size is very demanding on the optics and there are not many options that cover well a sensor of this size. There is an optional external guiding head for the STL that is very convenient for imaging with narrow band filters. In my experience the external guiding head fitted with the tiny e-finder (see VC200L photo) can succesfully guide while imaging at 2000 mm f.l. 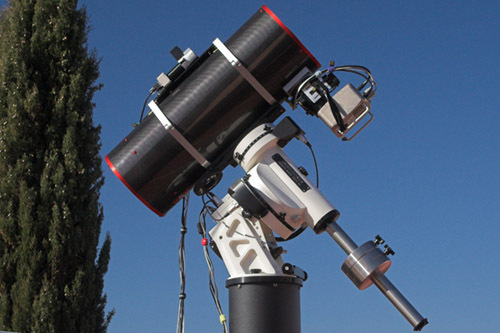 An Astro-Physics 1200 GTO mount is used at the Azor Observatory site. For portable operation a Losmandy G-11 and a Vixen GP-DX are used. 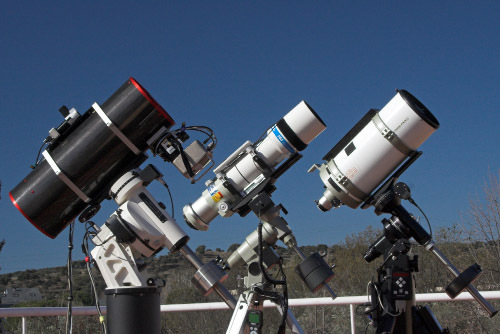 The image shows the three mounts, from left to right AP1200 GTO-ASA N10, Vixen GP-DX Takahashi FSQ and Losmandy G-11 Vixen VC200L. All Contents copyright © 1983 - 2007 Antonio Fernández unless otherwise noted.